In the newsroom, editors used slang for a certain type of story: “man bites dog.” It referred to the unusual, offbeat, and yet predictable events which audiences love but journalists find somewhat tedious because their only hook is their ironic nature. In today’s man-bites-dog news, we have terrorism, but it is unusual because it is white people shooting Muslims instead of the other way around. In fact, this attack was a revenge attack for the killing of Swedish schoolgirl Ebba Akerlund in a truck-based Muslim terror attack. 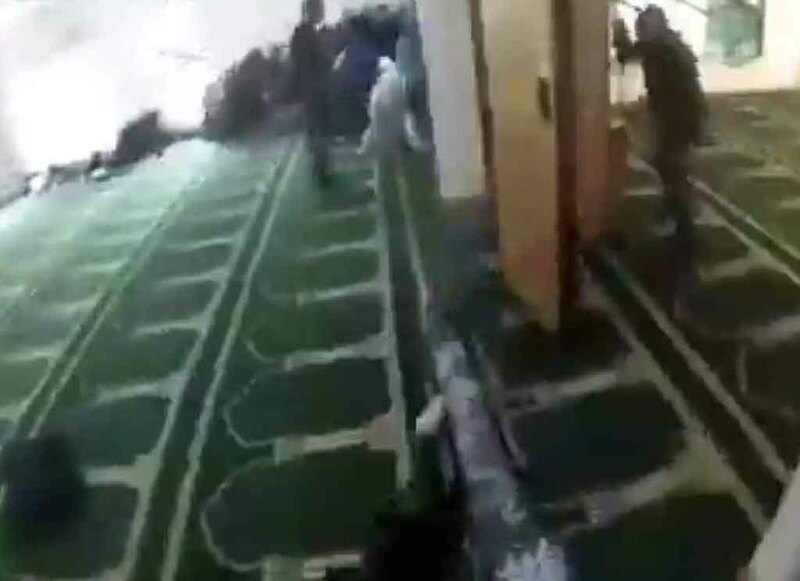 You can read the full motivations behind the event in the shooter’s manifesto (1 2) and you can watch the video below taken by the shooter, who has been named as Brenton Tarrant. Most of the world will now busy itself with two useless activities. First, people will moralize about this and how terrible it is that unarmed people were shot during the activity of religious observance. This mental spam tells us nothing that we do not already know; it is not desirable to be shot, no matter what you are doing at the time. Second, people will offer up “hopes and prayers” (or agnostic equivalent) because that is the polite and impotent thing to do. Once these are done, there will be crackdowns on guns and white nationalists, or maybe just conservatives. All of these activities address surface issues, or effects, but do not touch the cause, which is an inner condition brought on by the structure of our society. For those of us from the realist side of things, this shooting or one like it was expected, mainly because this is part of the diversity arc. Those who rule for the purpose of power alone, sometimes called “tyrants” if only in intent, want to destroy the national culture of a society because it is their competition. They want ideology alone to be the ordering principle so that they can use it to manipulate people, because ideology consists of a good that is how things “should” be that will save the world contrasted with an evil that causes all our problems and must be destroyed. Ideology seduces the human mind because it takes a complex world and makes it into a simple one within the mind of the individual; this comforts them and gives them a sense of order, so the more chaotic society becomes, the more they cling to the pleasant simple answers instead of complex, difficult truths. Tyrants love diversity because it abolishes the national culture and replaces it with a political culture. Diversity does this because it has paradoxical objectives; it intends to preserve every culture in one society, but this requires equalizing their different behaviors so that there can still be one set of rules for everyone in that society. Since these cultures have some behaviors that are not shared, society defaults to the permissive, which means rules based on ideology, law, and economics rather than actual culture, which includes customs, aesthetics, ideals, and standards which seem arbitrary in a universal context but make sense to those who have grown up in each culture. Diverse groups cannot co-exist because each group acts in its own self-interest alone. This means that it adopts many behaviors simply to signal “this is who we are” and to avoid pitfalls that it recognizes for itself. People in these cultures are also genetically different, having evolved for much of their existence apart from others and in specific circumstances — climates, politics, religions, regions — that shaped what they value both in the present and in terms of desires for the future. In the diversity arc, different cultures are brought into one area. They then accept a national political culture which is permissive so that each can have its own local culture. However, as the diverse groups gain numbers, they push back against the indigenous majority population, since each group wants to assert its culture as dominant in order to avoid that culture being usurped by others. Each group finds itself unstable unless it is in a leadership role, and that requires suppressing the others. As a result, these groups start to attack each other in a passive-aggressive bullying strategy, where they act out exaggerated versions of what is normal for them and then cry victim when other groups object or counteract them. Like all traps in life, the diversity arc starts with peaceful coexistence and ends in a final religious, ethnic, cultural, and racial war in which only one group can come out on top, or all groups become neutralized through interbreeding and you are left with a people without a living culture who act out dramatic versions of the past that forget why they adopted those folkways in the first place. Diversity destroys all cultures involved, and no one is happy. In New Zealand, we see an early late stage diversity arc event: Muslims have made inroads into a foreign land, and have set up mosques and demanded compliance with their arbitrary religious and cultural customs. As a result, the indigenous — in this case, the English settlers — are feeling displaced and a lack of unity to their civilization, since their culture has been abolished. Usually, ethnic groups act out through crime before anything else, starting a low grade cultural conflict with daily acts of passive-aggression, theft, and assault. Over time, it becomes clear that diversity has created a struggle for power, and so the different groups and the majority come to trading blows. The shooting in New Zealand follows the “trading blows” portion of the experience. It is lugubrious, but it is also predictable: this is how diversity ends. We do not need hopes, prayers, hand-wringing, or even hatred of Muslims. We should focus our anger at diversity, which obviously would produce this situation, and could have been entirely avoided because it serves no positive role in our society. We can cook ethnic food on our own using the magic of recipe books. We can study other cultures through their writing. We can learn about their people by visiting, or through the power of video documentaries. We can study their languages from tapes. When we mix cultures, we destroy all of them, and guarantee increasingly violent conflict in the process. If we wish to honor the dead, we should take a long hard look at diversity and realize that its endgame is destruction. Nothing good will come of it. There is no point scapegoating Muslims, whites, Jews, Christians, Africans, Turks, or Freemasons for what is obviously a failure of policy because our applied ideas were based on unrealistic ideas which came out of a conjectural, Utopian, apocalyptic, and messianic ideology which says that we must all be equal and therefore, we must import the foreign in order to show how equal we all are, and to break down social boundaries, hierarchies, and barriers so that each person is accountable to nothing but himself (and our laws, ideology, and economy, of course!). I hate these events because they show how diversity has made us all enemies, instead of bringing the paradise of peace and equality that was promised, and because of how wholly unnecessary all of this is. Speak the greatest taboo of our time — “no one is equal” — and reject diversity, because it brings nothing but more of the same, whether the perps and victims are white, Muslim, or from some other group. There is no future in diversity but death.